Fantastic Tybee Beach rental just minutes from beach! Discerning visitors to the Savannah and Tybee area often choose Tybee vacation rentals on the north end of the island as it tends to be quieter. It also puts you within short distance from the Tybee Lighthouse and Fort Pulaski. The beaches up here are more secluded and make great bird-watching spots. One of our vacation homes Tybee GA located on the north end is the Wade on Water property. 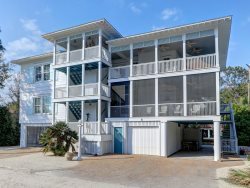 This is a good property for small family Tybee Georgia vacations as it has two bedrooms and two bathrooms and can sleep a total of four guests in just over 1,000 square feet. Each bedroom has a queen size bed and there are four flatscreen TVs throughout the house. It also includes a full kitchen, a washer and dryer, wireless internet, a covered porch, large yard and even a deck off the master bedroom. The location is just off the 80 and very close to the Tybee Island Visitor Center and the 80 East Gastropub restaurant. The interior of this property is light and bright with wood floors punctuated by area rugs. The living room is cozy with plenty of seating and a TV. Down the hallway from there is the kitchen, dining area and small breakfast bar. The floor plan is very open and there's another small seating area with a TV so that everyone can socialize around meal times. The kitchen is outfitted with everything you need to enjoy breakfast, lunch and dinner. Upstairs you'll find the two bedrooms. The master bedroom overlooks a deck with double doors leading out. Both bedrooms have TVs and ceiling fans. The balcony is huge and has plenty of chairs. The covered porch is also quite roomy and a great place to relax in the evening or morning. Finding things to do near our Tybee vacation rentals won't be difficult at all. Although small, Tybee Island is full of restaurants, sights and activities. The fact that it's small just makes it easier to explore without a car! Three fun ways to explore Tybee Island without a car include bikes, golf carts and of course, walking. This property happens to be very close to the Tybee Golf Carts business. You can rent carts with room for four to eight passengers and meander around the roads and off the beaten path on Tybee Island. Tybee Island is also very friendly to bikers with lots of scenic trails and roads set up to accommodate bikes. Tim's Bike and Beach Gear is a great place to rent and will even deliver your bikes. You can go just about anywhere on a bike. As Tybee Island is only about five miles around, it's also quite easy to walk just about anywhere as well. When you stay at vacation homes Tybee GA, it's likely that visiting the beaches are at the top of your list. The most popular beaches are on the east and south side facing the ocean, but they are also the busiest. For more seclusion, you might check out the fresh water beaches on the west side or the rockier beaches on the north end at the mouth of the Savannah River. Probably the top attraction on Tybee is the lighthouse and museum on the north end. You can enjoy a guided tour and also climb to the top of the lighthouse for an amazing view of the island. Some visitors spend their entire Tybee Georgia vacations relaxing on the island and that's quite understandable. However, if you have some extra time, it's worth it to take the 30 minute drive into downtown Savannah and enjoy some of the sights in this historic city. Top places to visit include Forsyth Park, River Street and the City Market. If you're in a hurry, you can also board the Old Town Trolley and get the full tour. You might even just pop into Savannah for an evening to experience one of the legendary ghost tours. Book with Southern Belle on your Tybee Georgia vacations and get amazing beach houses that will put you near everything you want to see. Our Tybee vacation rentals are always fully furnished and spotless upon your arrival. Find your next favorite vacation spot on our website and book with ease. So fabulous!!! Friendly and knowledgable. Very pleasant and easy to talk with. Were honest wiith answers to any questions. Well maintained home and very clean.